Climate change influences every aspect of life on Earth. The world’s 500 million smallholder farms are expected to experience its harshest effects. Already, climate change affects food security. In the coming years, African and South Asian farmers will experience an 8 percent yield decrease in major food crops. Farmers and development organizations must respond with new approaches and commit to collaborative action. 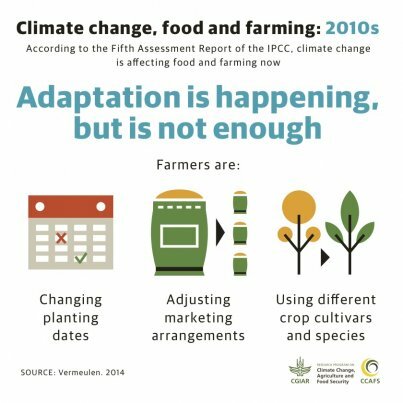 Farmers know weather patterns and are skilled at adjusting to changes. Development and research organizations can complement these modifications with new ideas. Solutions such as urea deep placement (UDP) and integrated soil fertility management (ISFM) strengthen soils and crops against climate impacts. These tools can also increase profits. New finance options, such as crop insurance, protect farmers from total losses caused by storms and droughts. A myriad of tools exist, but we must work together to imagine and implement more. Envisioning sustainable answers requires collaboration. U.S. Secretary of State John Kerry poignantly captured the sentiment in a recent op-ed, “We need to solve [the problem of climate change] together because neither one of us can solve it alone.” The newly formed Global Alliance for Climate-Smart Agriculture aims to revolutionize global climate change engagement. Working together, the alliance can help farmers tap into their potential. With collaboration, climate change can become an opportunity for success. Stay tuned as we continue piecing together the innovation puzzle. Up next week: Agricultural innovation increases farmers’ incomes. Join the discussion on Twitter with @IFDCNews.